Having started to float along on the festive tide with my christmas garden post at the weekend, I took two toddlers to the zoo in Regent's Park yesterday to see the reindeer, as you do. Their day was made up when one of the reindeers obligingly turned his back and did a poo right near to where we were watching. Joy and laughter are very poo related in the life of a two year old. My day, on the other hand, was complete when I detoured to see the hippopotamus and came across a giant decorated cedar tree. Its lower branches were covered with wishes and hopes, written on luggage labels and other tags, tied to the tree. It was a glorious sight and made for some lovely reading. If only they'd thought to use waterproof pens! The synchronicity of seeing this when I'd just written about creating a wishing tree was very thrilling, not to mention inspirational. Pink Sorbus berries where they'd fallen onto ivy - I'll use these plus more in a wreath. Is it really only 10 days until Christmas? The veg patch garden is still being treated to resolutely mild weather so I'm able to potter around getting ready for next year but I can't ignore the festive lights in trees along local avenues or the buzz of people preparing for christmas. Those lovely people over at Plant Me Now have provided the kickstart to think about extending seasonal decorations into the garden with their Christmas competition on Facebook. I'm giving the heads up on this one as the prize is £100 to spend in their online shop and let's face it, who wouldn't want to win that! Their plug plants were well reviewed by Helen over at Patient Gardener this year and I'm always happier with a personal recommendation. Personally, I've fallen in love with a gorgeous dusky rose coloured delphinium that I'm coveting for my flower patch next year, middle bottom of this link. (Oh, be still my beating heart!) You've only got one week to enter as the deadline is next Sunday, 22nd, (take a photo of your decorated garden, 'like' their FB page, upload your photo); it's worth a shot as, so far, there's only a few entries. Although bright sparkly lights are good for jollying things up on a commercial level, I prefer something altogether more subtle in my own home - and that also extends to the garden. I love the simplicity of cinnamon sticks and dried orange peel tied onto a swag with a bit of ribbon. For me, colours should harmonise with nature: think wood, robins, nuts and cones, stones, grey skies, white snow and icicles. Wonderful. Nature offers plenty of inspiration if you look around and that's what I went in search of. 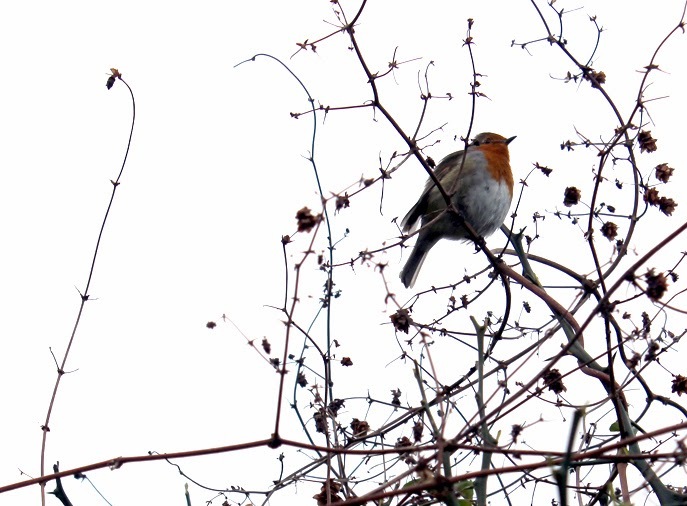 On Saturday I went for a little wander, bag over shoulder, secateurs in hand (just in case!). In the York Rise gardens I found rose hips, cornus stems, juniper branches, rosemary stems and ivy leaves. Walking in the Capel gardens, I'd already foraged fallen crab apples and - to my extreme delight - the fallen pink berries from the Sorbus hupehensis tree (Rowan). The purple berries from Callicarpa would also have been wonderful, as would the fluffy tips from a Miscanthus grass but I'm loathe to take something that nature isn't quite ready to part with. Fallen crab apples tied with florist's wire and hung on a christmas tree. Walking through the woods, I spied a sheath of branch tips lying on the ground; they look like silver birch and I presume a child had gathered them up while walking and then been told to leave them behind. As I picked them up and rolled them into a circle to fit my bag, it occurred to me that they're so fine and pliable, they would be perfect as a base for a door or tree wreath. Bizarrely, I couldn't find any pine cones, despite large numbers of pine trees up at Capel but I did find plenty of acorns and their cups which were added to my goody bag (inspired by the acorn babies in the collage below). • Real christmas trees. I absolutely hate to see all those sad, brown, rootless trees dumped after christmas. If you must have a real tree, please buy one with roots, plant it properly in a deep pot of soil with good drainage, by all means decorate it but put it outside where you can see it. Your tree will thank you for it and you'll be happy as you won't have to clear up thousands of pine needles. Leave it in the pot, well watered throughout the year, and you won't find yourself with a 40ft tree outside your back door in ten years time but will be ready when christmas comes round again. • Let your garden have a holiday. Don't go mad sweeping up leaves and tidying the garden. If you've done a bit of pruning or have logs for the woodpile, great. Leave them in a heap for hibernating hedgehogs, if you're lucky enough to have them. Ladybirds and other beneficial insects like bees need somewhere sheltered and safe to over-winter and will still be in your garden in spring if they find a welcome there in winter and nectar when they wake up. Birds too need food and water. 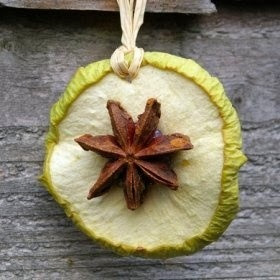 I like the look of these apple decorations but would hang them outside for the birds rather than indoors. And put out home-made fat balls, recipe from Fiona at The Cottage Smallholder. Image from my Pinterest page. 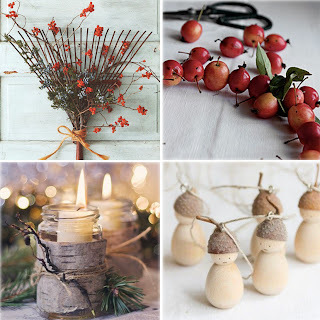 Images from my Pinterest 'Christmas Garden' page but … loving those candles tucked into hagstones! • Connect. Next Saturday is the Winter Solstice. 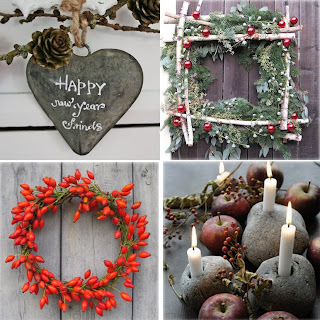 (Interesting Yule facts and the story of mistletoe through the Solstice link.) It's a day that I always observe with quiet contemplation as the world starts to turn towards spring and renewed life. The days will start, imperceptably, to get longer; we may not notice but the plants will. 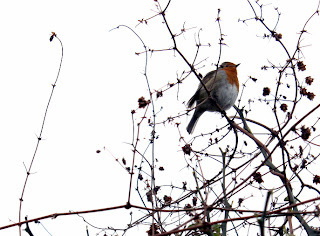 It's a day to connect with nature, neighbours and family - perhaps over tea and cake. • Dream. Look over the bare bones of your garden and plan for next year. I love this time of year for looking through catalogues, reading gardening books and visiting public gardens - the structure of the garden without its summer dressing is revealed and there's a lot to be learned from that. • Decorate your garden! Bare branches of trees are perfect for adding ribbons, nut or fruit garlands, stars cut from recycled milk containers or, if you have time, laminate little messages of hopes, wishes and thanks for the year ahead and the year behind us and hang them up with pretty ribbons. I hope that this post will inspire people; if I have time, I'll post about the crafts I make … and don't forget the competition! Seen at Capel: Mushrooms and fairies in the garden! Surreal: so still that the droplets of thawed frost just hung there - not one of these fell! The icy fingers of Jack Frost have not yet touched the veg patch garden so I was super excited on my drive up to Enfield yesterday to see frosted allotments at the side of the road as I knew this meant it would be proper frosty in the gardens at college, at least at the start of the day. Crystallised plants have a novel beauty at the beginning of the winter and I wasn't disappointed. Back in the veg patch this morning, it's quite mild but nonetheless I've popped a cloche over a couple of the more tender herbs. I say 'cloche' - actually, it's an upturned clear plastic storage box which did the job perfectly through the last year's winter and ensured the vigorous survival of the French Tarragon, a herb widely known for keeling over in the bitter cold. Herbs that need protecting in my garden are lovage, blackcurrant sage (still with beautiful bright pink flowers!) and french tarragon. All the others are tough as old boots and come back year on year without my help: fennel, mint, oregano, horseradish. Flat and curly leaved parsley, lemon thyme and sage are still going strong and being regularly used by me and my neighbours which encourages the plants to keep producing and stay healthy. And the work goes on: I love being outdoors, particularly this week as I have a heavy cold and feel so much better for being outside! I'm gradually getting more raised beds built and filling them with spring plants and strawberries for now - white violas, polyanthus, saffron crocus and dianthus - all edible flowers that will have lettuce sown into the gaps in late spring. And the next big push will be to decorate the garden a little bit to mark Christmas and the year end. More next post.